When Qualcomm announces a new class-leading mobile chip, even the less technical among us tend to take notice. 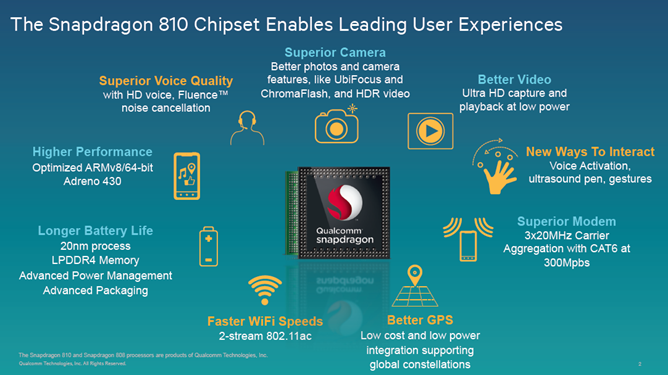 So, meet the Snapdragon 64-bit 808 and 810 processors - Qualcomm's most powerful mobile chips ever. 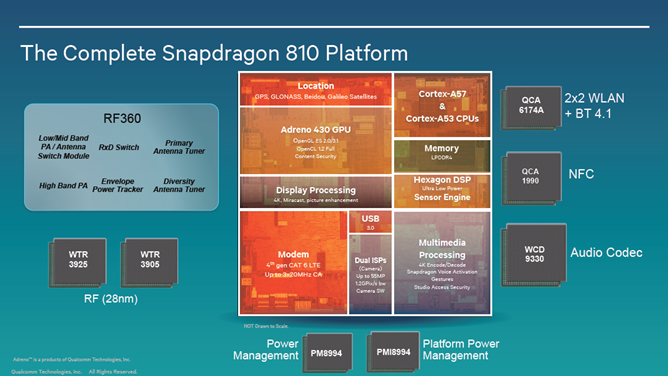 The 810 is an octa-core setup that will be utilized in a fashion similar to ARM's big.LITTLE architecture (as will the 808), though Qualcomm is using its own technology to manage how the cores interact, rather than an off-the-shelf solution. 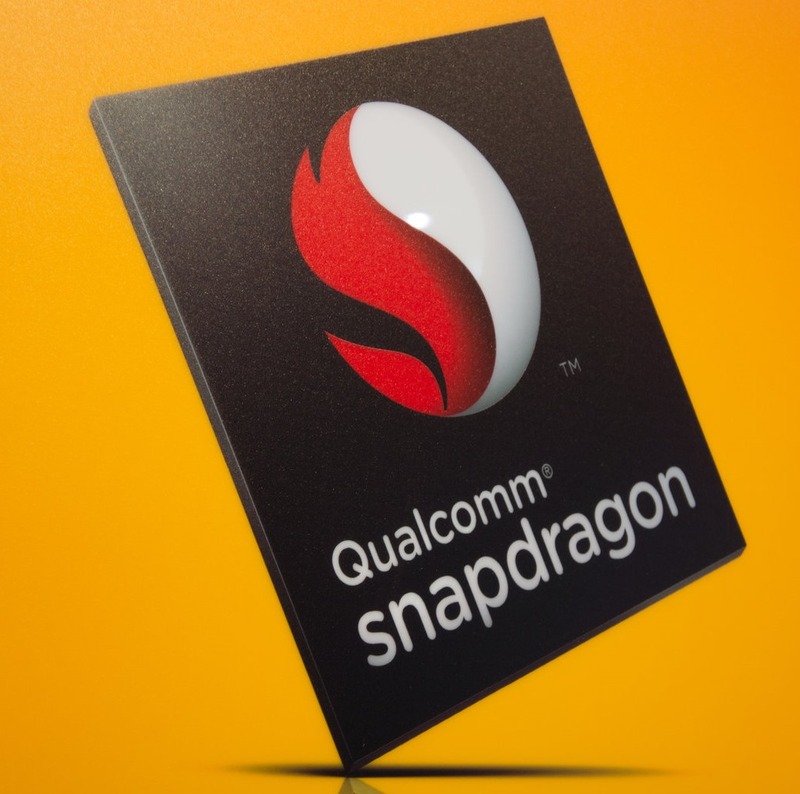 The quad-core A57 is a 20nm part, as is the lower-power A53 quad, though Qualcomm hasn't disclosed clock speeds for either. The 810 also marks the debut of a couple new pieces of silicon, including the Adreno 430 GPU (30% faster than Adreno 420) and a new LPDDR4-1600 RAM interface (still dual-channel), as opposed to LPDDR3. The 808 is a down-market version of the 810, using dual A57 cores as opposed to quad, though with the same 4-core A53 for power conservation. The GPU is downgraded to the newly-announced Adreno 418 (only 20% faster than Adreno 330, making it seem like an amped-up version of that GPU), and the RAM is LPDDR3. Both chips also feature Category 6 LTE, offering speeds up to 300Mbs utilizing tri-band carrier aggregation. You probably shouldn't expect those kinds of speeds on your carrier any time soon, of course, unless you're in Korea. Unfortunately, while the hexa and octa-core Snapdragon 808 and 810 do represent Qualcomm's beefiest offerings to date, they're also probably aimed squarely at Asia, especially given their planned market debuts: not until the first half of 2015. Qualcomm has regularly spoken in recent months of high consumer demand in Asian markets for phones with an ever-increasing number of cores. That is, people buying phones in Asia actually care a lot about this specification - hexa and octa core devices are simply perceived as superior, regardless of the technical merit behind that perception. Qualcomm is also quick to point out that western markets, like Europe and the US, simply do not mirror Asia in this way - consumers are far more concerned with other device performance factors, like battery life. This makes it seem likely, even inevitable, that Qualcomm will push more efficient designs, or at least ones that are cheaper, in the western world for the time being. 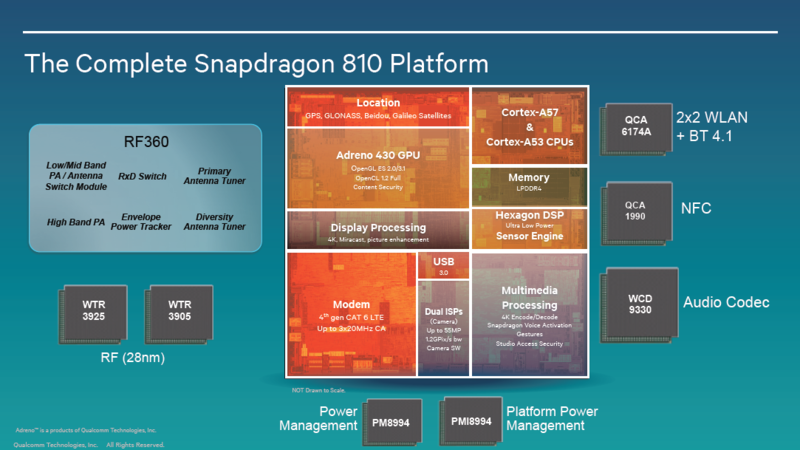 The Snapdragon 805 would seem to be the likely candidate for high-end devices being released throughout the rest of the year at this point. After all, it's still a pretty incredible chip - with Krait 450 CPUs clocked at up to 2.7GHz and the Adreno 420 GPU (40% faster than Adreno 330), it's probably not all that much slower than the new 810. In fact, its GPU is actually a higher-end part than the Adreno 418 featured in the Snapdragon 808, which I think is fairly telling. For more, check out Qualcomm's blog post on the announcement, below.